LOLV | What Does LOLV Mean? LOLV means "Lots of Love". The abbreviation LOLV is typically used to say "Lots of Love", and is sometimes written as LOLv. LOLV is not usually used to express true love to someone, and is mostly used between friends as an affectionate way to say "goodbye" and close a conversation. 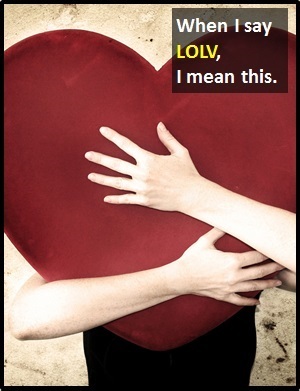 LOLV means "Lots Of Love", and is an affectionate informal way of closing a conversation. Ken: Great to see you today. Lynne: You too. LOLV. See you again soon, I hope. Shazza: You are the biggest idiot I know. Marlon: You're too kind. LOLV to you too. LOLV is an initialism abbreviation. This means it is pronounced using its individual letters (i.e., Ell Oh Ell Vee). Initialisms contrast with acronyms, which are spoken like words. LOLV can be used as a standalone declarative sentence (i.e., a statement). In other words, it is not necessarily used as another part of speech within a wider sentence. For example, when closing a conversation.